Ah, Red Faction. The cool shooter games with the even cooler destructible environments engine! Sadly the series seemed to die out when the original THQ closed back in 2013, and it didn’t help that the last game in the series Red Faction: Armageddon didn’t perform too well. But today, we have THQ Nordic, a company that loves to rerelease old classics in modern form. Earlier today various European GameStop websites had a listing for Red Faction: Guerilla for PS4 and Xbox One. The listing seems to have disappeared since then, so we hope that only confirms that the game is indeed coming to modern consoles. 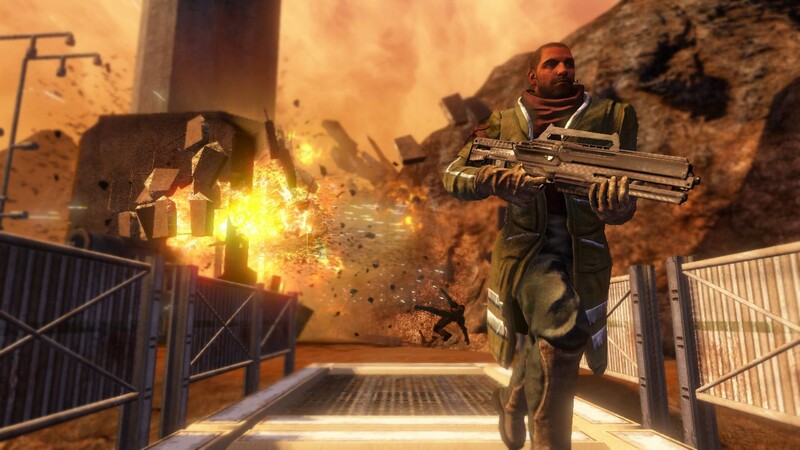 Originally released in 2009, Red Faction: Guerrilla shifted the series from first-person to a third-person open world adventure. Still set on Mars, the game followed mining engineer Alec Mason as he travels to Mars to begin a new life. The Earth Defense Force, the allied group from the original Red Faction, has now become an oppressive force ruling workers on mars with an iron fist. However, with all bad governments, there’s always a good rebellion, and thus the Red Faction is born anew. Red Faction: Guerrilla enhanced the series’ trademark “Geo-Mod” engine by allowing players to break through multi-layered structures and landscapes, giving you the freedom to literally use the world as a potential weapon. The game also introduced a number of cool vehicles and mechs that Mason could pilot to really bring the pain on the EDF. While it’s flat out awesome that we can play Guerrilla again on modern consoles (there’s also the Steam version that’s already modernized), we hope this catches a new wave of attention. The Red Faction series is a pretty cool FPS series that we’d like to see more games of, so here’s hoping!